Are you a proud dog owner? Does your pet like to ride with you when you go places? It can be a lot of fun taking your dog along with you everywhere you go but it can make keeping the interior of your Toyota clean a bit difficult. It doesn’t matter if you’re planning a long road trip or going to the local park, pets can be messy. Even if you brush and groom your dog regularly, pet hairs will still end up on your seats. Another problem with taking your furry friend along for a ride is the fact that all dogs drool. They also track mud, dirt and other debris inside your vehicle that can stain the seats and turn your interior into a nasty mess but don’t worry. There are ways that you can protect your vehicle’s interior when traveling with your pet. If you love taking your dog with you when you travel but you hate the mess he leaves behind, there are ways to protect your vehicle. You don’t have to miss all the fun and excitement of traveling with your pet or deal with a messy interior. Use seat covers or protective dog covers made especially for pets. These will catch all the dog hair, drool and the dirt and mud stuck to her paws. It will also prevent her from scratching or tearing holes in your upholstery. Confine him to one location of the vehicle with a pet restraint or crate. Securing your pet will prevent him from running around the vehicle and keep him safer if you’re involved in an accident or slam on the brakes to avoid one. Don’t feed your pet a heavy meal right before leaving. This can make her carsick, which can lead to a big mess for you to clean. Vacuum after every trip and clean up any mess your dog makes immediately. This will help to prevent stains and ground in dirt from ruining your upholstery. Stop frequently to allow your pet to relieve himself. This will prevent him from having an accident in your vehicle. These tips will help you protect the interior of your new or used Toyota and keep the inside of your vehicle looking like new. Keeping the inside of your vehicle clean and free of damage is very important, especially if you plan to use it as a trade-in later. 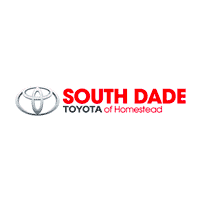 Here at South Dade Toyota, we have a large selection of new and used vehicles to choose from and the amount you receive for your trade-in depends on the overall condition of the vehicle inside and out. Keeping your interior looking and smelling good is also important for your human passengers. Your don’t want the rest of your family or friends to be covered in pet hair or deal with that dog smell every time you take them for a ride. By taking a few precautions and following the tips above, you can travel with your dog as often as you like and still have a clean vehicle.